A unique solution for a room with an L-shape sectional sofa, this wedge table has two lift-tops. That way, two people can share the table for work, studying, or eating. The table boasts a stylish clipped corner design and an extra display shelf at the base. 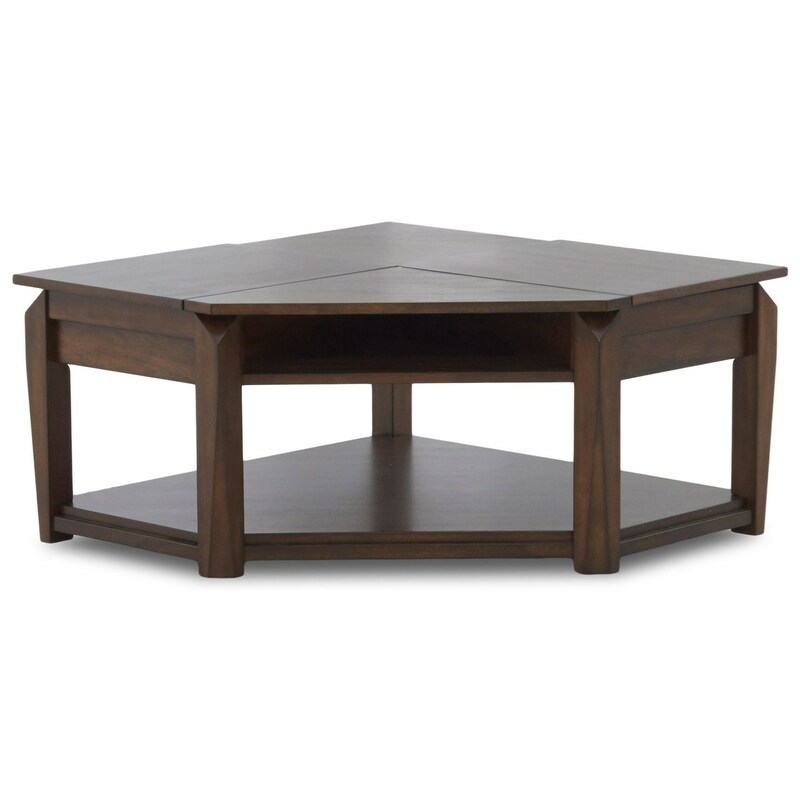 The Wedgeland Casual Wedge-Shaped Cocktail Table with Two Lift-Top Surfaces and Casters by Klaussner International at Furniture Mart Colorado in the Denver, Northern Colorado, Fort Morgan, Sterling, CO area. Product availability may vary. Contact us for the most current availability on this product. Storage Two lift-top surfaces. One display shelf, one open compartment. Accent tables should be an essential part of your living room rather than an afterthought. The tables in this collection add convenience and functionality, making it easier to relax and do the things you love. The signature cocktail table, for example, provides two lift-top surfaces to use as trays or study desks. Create a living room you'll truly want to live in with fantastic furniture. The Wedgeland collection is a great option if you are looking for Casual furniture in the Denver, Northern Colorado, Fort Morgan, Sterling, CO area. Browse other items in the Wedgeland collection from Furniture Mart Colorado in the Denver, Northern Colorado, Fort Morgan, Sterling, CO area.